METHODS: This paper applies a Kalman filter to South African data and compares the results obtained with those filtered using the Hodrick-Prescott filter. CONCLUSION: Buffer signals are strongly dependent upon the filter employed to detect procyclicality. The South African Reserve Bank and other regulators should reconsider the use of the Hodrick-Prescott filter and entertain the possibility of using the Kalman filter instead. The procyclical nature of financial markets is well documented as are the intrinsic procyclical characteristics of regulatory capital regulations prior to Basel III. Several studies including Heid (2003), Gordy and Howells (2004) and Goodhart and Taylor (2006) forewarn that the procyclical nature of regulatory requirements impede macroeconomic stability as these regulations force institutions to retain more capital in low-profit, liquid divisions when they may need to continue extending credit. This institutional behaviour and the inability of risk measurements to capture this phenomenon proved to be disastrous in the 2008/2009 financial crisis. Conventional measures such as Value at Risk (VaR) and its successor, expected shortfall (Basel Committee on Banking Supervision [BCBS] 2013), do not account for procyclicality as these metrics are volatility-based measures that use procyclical historical data (these have no components which indicate the financial cycle's position). The BCBS proposed the implementation of a Countercyclical Capital Buffer (CCB) to promote the macroprudential goal of protecting banking sectors from periods of excess aggregate credit growth (BCBS 2010a, 2010b). These periods have historically been associated with the build-up of system-wide risk and the CCB thus aims to ensure institutions are not only solvent through stress periods but also able to maintain the flow of credit. Research on the CCB since its introduction has been plentiful, but the metric has several indicator components that signal the retention of a CCB buffer as well as indicators that signal the buffer's release. Determining these signals has received significant interest, because, initially, the BCBS (2010b) only mentioned a one-sided Hodrick-Prescott (HP) filter1 in a footnote. Burra et al. (2014) discussed practical considerations for the CCB in South Africa as proposed in Basel III. They found several series including credit extension, advances to the domestic private sector and house prices to be positively correlated with GDP growth. However, the credit-to-GDP gap was found to be negatively correlated with GDP growth, suggesting that buffers would accumulate in downturns, thereby fuelling procyclicality rather than countering it. They affirm that accurate build-up signals remain; however, they were significantly weaker in the buffer's release phase. Bernstein, Raputsoane and Schaling (2014) applied a Logistic Smooth Transition Autoregressive model to assess the credit-to-GDP as the recommended common reference for CCB implementation. The authors found that the credit-to-GDP gap decreased when the economic cycle experienced upturns and vice versa and thus caution the use of this standard as a uniform or mechanical estimate of countercyclical South African capital buffers. The Kalman filter - which was originally developed to provide aeronautical navigation - offers a different, but parsimonious and accurate solution to the problem of time-dependent variable estimation. The Kalman filter enjoys the advantage of real-time application. Time series observations are used to forecast future observations (as in most forecast applications), but in the Kalman filter case the state variables (which define the forecast framework) are 'optimal', being determined via minimisation of the variance between prediction and observation differences by rapidly reacting to changing conditions. This makes the Kalman approach to the problem of time-dependent variable estimation extremely practical to financial practitioners (see, e.g. Jain, Yongvanich & Zhou 2011; Thomson & Van Vuuren 2017). The remainder of this paper proceeds as follows: Literature study section explores the literature regarding procyclicality and the CCB from an international and South African perspective, respectively. The choice and extent of the data are explained in 'Data and methodology' section as well as the mathematics of the various filters including the Kalman filter. The logic behind how filters reduce signal variance when estimating unobserved moments is also discussed here. Results obtained from analysis are illustrated and discussed in the fourth section and the last section provides the conclusions. Procyclicality's ability to act as a financial accelerator in both expansions and contractions lies in information asymmetries between borrowers and lenders (Borio, Furfine & Lowe 2001). In distressed economic environments (where collateral values decline), even profitable borrowers struggle to find access to credit as institutions are more risk adverse and must retain more capital as suggested by procyclical regulatory capital models. In benign economic conditions, where credit extensions occur with fewer restrictions, institutions chase profitable positions as capital does not have to keep liquid reserves - thereby temporarily reinforcing the cycle's upswing. Borio et al. (2001) argued that the worst excesses of financial cycles can be mitigated; however, this requires the acknowledgement of increased risk in boom periods and that the materialisation of bad loans does not necessarily imply an increase in risk. Measurement difficulties and biases have also contributed to the effects of cycle excesses and procyclicality. Market participants often struggle to optimally assess how correlations between credit losses across borrowers and the financial institutions change over time (Drehmann, Borio, Tsatsaronis 2012). This, along with other measurement complications, has led to short horizons and extrapolation of current conditions further into the future than possibly deemed appropriate (Borio et al. 2001). Complicated risk measurement techniques, market participant behaviour and existing regulatory capital have all contributed to the phenomena of procyclicality and are all being addressed in the drive to mitigate it. Borio (2012) asserts that it is critical to rediscover the role of the financial cycle and its empirical features like procyclicality in macroeconomics as it is closely related to systemic crises. Secondly, Galati et al. (2016) suggest that statistical frequency-based filters include the HP filter, the Baxter-King filter (1999) and the Christiano and Fitzgerald (2003) filter. These require prespecification of the range of cycle frequencies and thus are referred to as non-parametric filters. These have been increasingly interrogated and compared since the introduction of Basel III to determine superiority under different scenarios compared to the BCBS's one-sided HP filter. A more dynamic, forward-looking buffer variation suggested by Wong (2011a, 2011b) manipulates time series data through an inflator to produce increased capital requirements for both market and credit risk. The credit version of the author's Bubble VaR model further attempts to combine default and spread risk under a single risk measure, arguing that this measure lies between spread risk and the principal loss of the bond (total loss). The benefit of the Wong's (2011a, 2011b) methods is that they avoid timing issues of a CCB buffer currently faced by regulators and financial institutions. South African applications of Wong's Bubble VaR methodology (and the performance thereof) have been conducted by Visser and Van Vuuren (2018, in press). South African data from January 1966 were used to determine the credit growth-to-GDP growth ratio as well as this ratio's long-run trend. Detailed examination of these data, using standard Fourier analysis, indicates that they exhibit cyclical behaviour. This result is not unexpected because they comprise several macroeconomic components (such as the economic - or business - cycle), which are inherently cyclical. 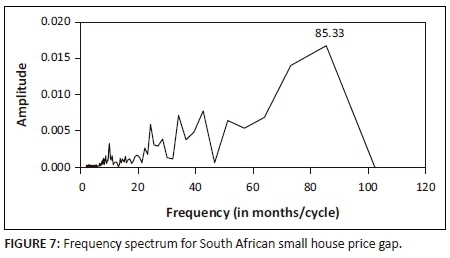 A Fourier frequency analysis of these data indicate that the main component has a frequency of approximately 7 years: the duration of South Africa's business cycle, found previously (Botha 2004) and confirmed in later studies (e.g. Thomson & Van Vuuren 2016). The HP filter has been criticised for several limitations and undesirable properties (Ravn & Uhlig 2002). Canova (1994, 1998) agreed in principle with the use of the HP filter to extract business cycles (of average duration between 4 and 6 years) from macroeconomic data, but doubted the methodology for determining key parameter inputs. 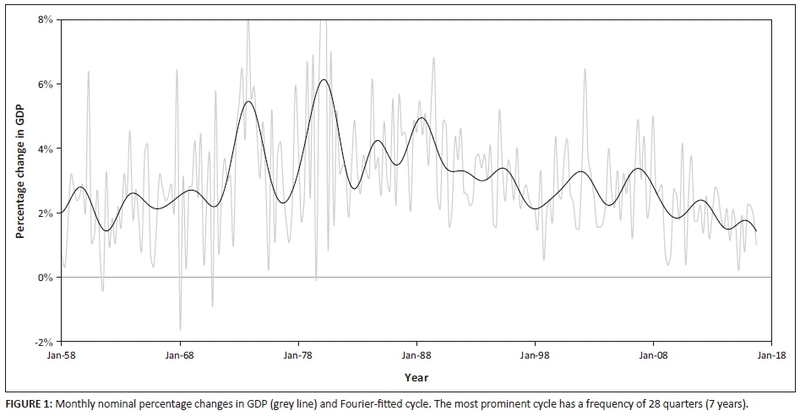 Spurious cycles and distorted estimates of the cyclical component when using the HP filter were obtained by Harvey and Jaeger (1993), who argued that this property may lead to misleading conclusions regarding the relationship between short-term movements in macroeconomic time-series data. Cogley and Nason (1995) also found spurious cycles (and extreme second-order properties in de-trended data) when using the HP filter on difference-stationary input data. Application of the HP filter to U.S. time-series data was found to alter measures of persistence, variability and co-movement dramatically (King & Rebelo 1993). Many of these critiques do not provide sufficient compelling evidence to discourage use of the HP filter. As a result, it remains widely used among macroeconomists for de-trending data, which exhibit short-term fluctuations superimposed on business cycle-like trends (Ravn & Uhlig 2002). In practice, the process noise covariance Q and measurement noise covariance R matrices (here variance matrices because the correlation is zero) change with each time step. In this case, they are assumed to be constant (Koch 2006) - a common assumption - and these values are obtained using maximum likelihood methods (Tommaso & Alessandra 2012). In the last decade of the 20th century the HP-filtered series increases additional capital by more than 2% - although only briefly. 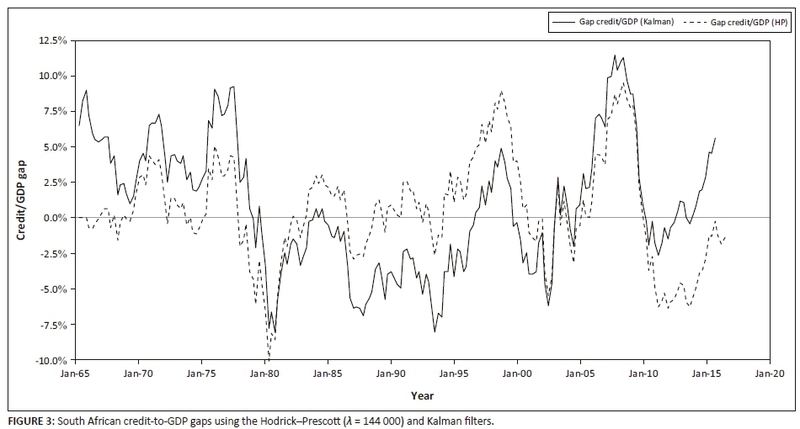 This is because of the long-term trend derived through the HP-filtered series (Figure 2) being notably lower compared to the Kalman-filtered, long-term trend. Additional capital charges in the late 1990s are partially because of the lack of global demand for commodities as a result of the Asian crisis and the severe depreciation of the South African rand in 1998. 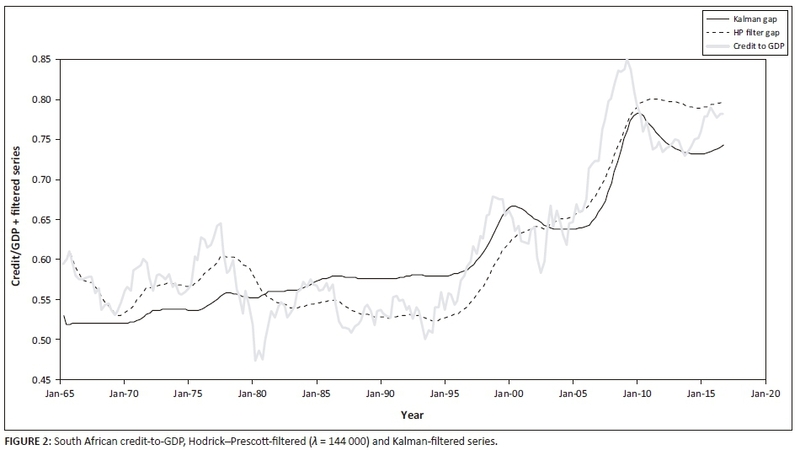 The South African small residential price index and its Kalman-filtered, long-run trend in Figure 5 illustrate how the South African residential market benefited from the pre-crisis global housing market boom. The subsequent crisis did not impact the South African market as severely as it did other countries' housing markets: some of this may be attributed to the National Credit Act (NCA) of 2005. This legislation along with other measures curbed reckless lending by financial institutions, partially protecting the quality of assets on intuitions' books. 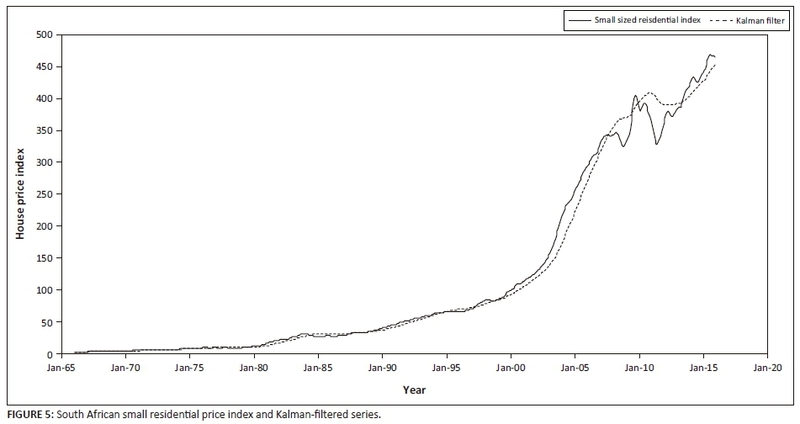 Figure 10 illustrates that the residential price index would have suggested a CCB long before the onset of the crisis. Suggesting stringent buffer requirements from the onset of the millennium might have been too severe and would potentially have hindered economic and financial market growth. 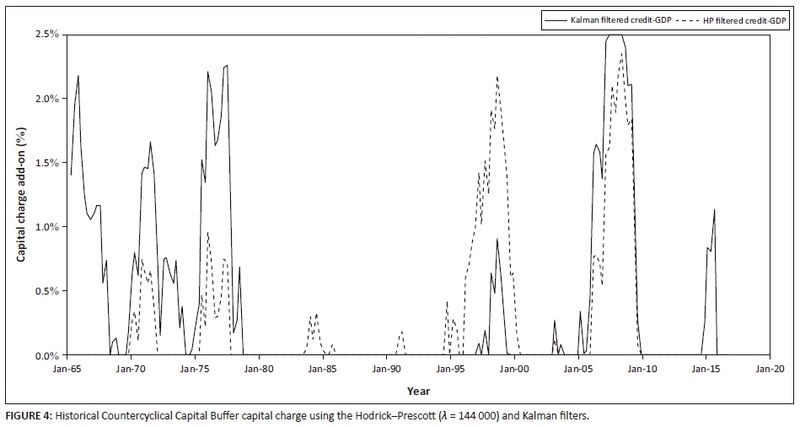 The superiority of the Kalman filter over the HP filter cannot be concretely established for the buffer (estimated using the residential price gap) as buffer-retention signals leading up to 2003 are similar. The buffer's release signal under the Kalman filter approach is more rapid: this should be further explored in future research. 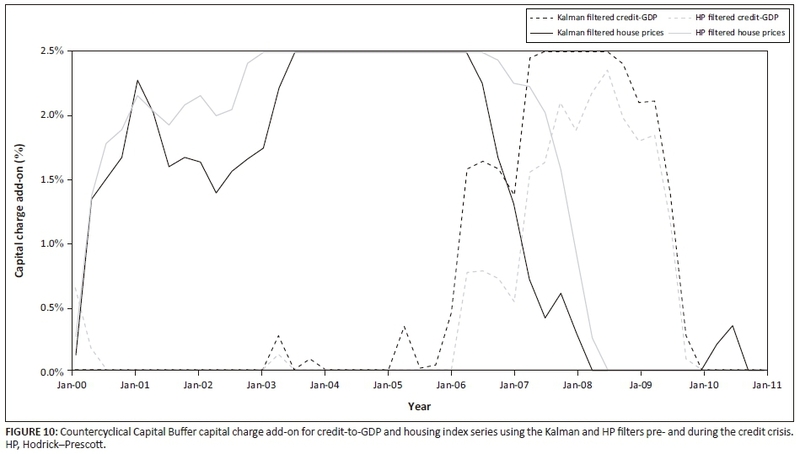 The credit-to-GDP gap buffer estimated with the Kalman filter for the crisis period is more conservative compared to the buffer estimated with the HP filter. 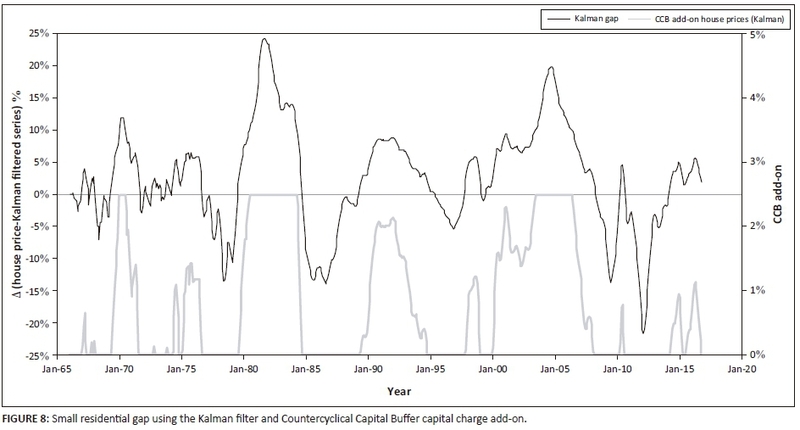 The Kalman filter-estimated buffer reaches the maximum prescribed 2.5% and maintains it throughout the crisis period, eventually diminishing along with the HP-filtered buffer. The accumulation of the buffer also begins a few months prior to that of the HP-filtered approach and may have countered procyclicality and acted as a warning signal. The CCB was introduced to limit the effects of procyclicality, but several aspects need to be considered. These include retention and release signals as well as techniques to determine these signals with appropriate variables. The information used in setting the CCB must capture up- and downswings inherent in the financial cycle. The development of system-wide risks is associated with the buffer's build-up phase while financial contractions correspond to the buffer's release phase. Doubts have been expressed about a single measure reliably capturing both the build-up phase and the release phase: robust leading-indicator properties are required for the former and a reliable contemporaneous indicator is required for the latter, as pointed out by Drehmann et al. (2010). In addition, a good proxy for the build-up phase should vary considerably from its long-run trend during the build-up phase (a feature which would rule out non-performing loans - bounded at zero - e.g. and would limit the information content of credit spreads). Credit spreads, however, would provide much useful information about release phase timing (Chen & Christensen 2010). This paper applies a Kalman filter to the BCBS-prescribed and other financial variables to determine the appropriate signal for the implementation of the CCB. Results indicate that for different crises, results obtained from the Kalman filter and the one-sided HP filter suggest substantially different signals - excluding for the most recent crisis (where the results are similar). This paper corroborates the findings of other studies which find that the credit-to-GDP gap would likely fuel procyclicality rather than dampen it (e.g. Borio et al. 2001; Creal et al. 2010; Koopman & Azevedo 2008) for South Africa if employed as a sole measure. 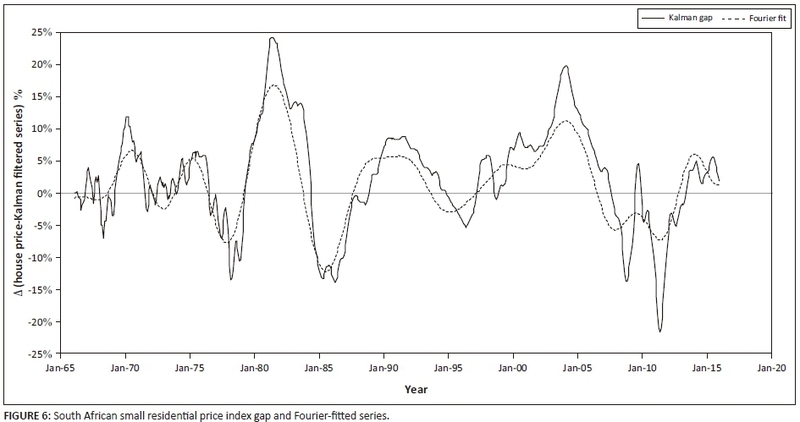 The small residential price index gap identifies countercyclical signals that would have suggested full CCB retention for substantial periods prior to historical crises. This emphasises that, although the metric used to calculate signals is important, the variable used to calculate these signals is a critical input as the incorrect one may fuel procyclicality. The South African Reserve Bank (SARB) suggested that it would still use the credit-to-GDP as a principal indicator for the CCB; however, it further asserted that it would use other indicators in conjunction with the credit-to-GDP gap (SARB 2015). 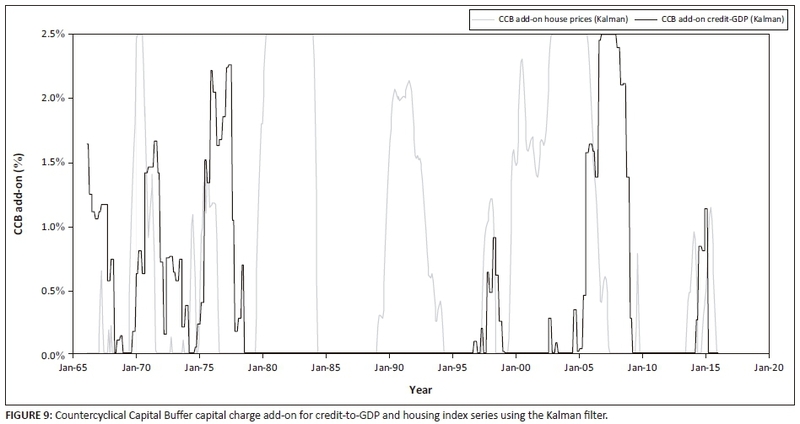 Future research opportunities include an investigation into how the Kalman filter approach performs in conjunction with other variables that have been found to be more suitable for CCB buffers in South Africa than the credit-to-GDP gap. Work may also focus on buffer-release signals and how measures such as the Kalman filter recognise these occurrences. A combination of models that avoid timing issues such as Wong's (2011a) BuVaR model and filter-based approach also present future research opportunities. Solutions to such an approach would be of considerable value to regulators and financial institutions in resolving their current (2017) dilemma regarding CCB timing issues. In addition, we note the possibility of ultimately incorporating machine-learning into the processes described here. Machine-learning and artificial intelligence (AI) are already widespread in the financial industry and pattern identification - on the skill and timeliness of which this paper is based - is ideally suited to AI applications. Thus, it is probably only a matter of time before AI is used for cyclical identification and thus mitigation. It could be argued that embracing AI has thus been proposed in this paper because the Kalman filter is, effectively, a Bayesian variance-reduction tool, a fundamental building block of machine-learning. 1 . See Data and methodology section. 2 . See Data and methodology section. 3 . A classical methodology focuses purely on changes in the levels of economic activity and not on the fluctuations of these activities around their long-term trend.